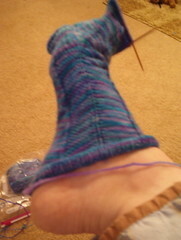 My Jaywalker sock is too small! I decided to try it on yesterday and I couldn't get it past my heel! I've never had that happen before. It's got to be the pattern making it tight... I should done the bigger size! At least this picture finally shows the true color of the sock yarn. P.S. I bought more sock yarn... aren't the colors so cool! I just love it! Felicia from Sweet Georgia has such a great sense of style! I love her yarns! Ok that's my confession for the day. I had the same issue with my Jaywalker. I tried it with 2 different yarns and the same thing happened. I'm taking a break from mine. I was told it'll stretch a little though. This is what mine looked like today...except I was using pink yarn. Wah! Did you try the bigger size, yet?